Conferences don’t tend to be my cup of tea. For a start, the cups of tea are always tiny. You have to drink at least three to equal a normal mug size. But it’s not the tiny teas that are the worst thing. Not by a long shot. It’s all the bloody networking. It reminds me of the very first work party I ever attended in my first job after uni. I was working for a newspaper and the work party happened to be taking place a fortnight after I had started. Nervous enough already (of being in an office; of being expected to know how to do things like filing and replying to emails and generally behaving like an adult), the thought of having to stand and sip champagne and make small talk with all these deeply intelligent journalists, whose photo bylines I had been looking at for years, was absolutely terrifying. I arrived at the party, and stood at the back, clutching a glass of champagne and talking to the next most junior person in the office. I swear, it honestly took me a good minute to realise he wasn’t joking. 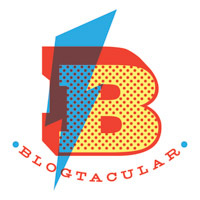 But Blogtacular, the blogging conference I went to yesterday (of my own volition!) isn’t anything like that, of course. Yes, there are the faces you recognise from the About pages, the bloggers you’ve followed for years and deeply admire, the same sense of trepidation on entering the room with everybody else chatting and laughing. But Blogtacular is billed as a place of creativity where people can come together. And this year, 2015, the overriding theme was collaboration. It was a packed day, almost overwhelmingly so, and there is really far too much to try and squeeze into one blog post. Plus, I know there are likely to be hundreds of posts popping up over the next few weeks with all sorts of information about the event. So, rather than a full account of what I did, here is just a gathering of some of the things I found most inspiring. Post-event Googling, I’ve discovered it is by Pamela August Russell. Beautiful, taut and haunting. Grace Bonney’s opening talk about harnessing fear of change was filled with fabulous soundbites. Perhaps my favourite was her belief that a blog “isn’t just about more, more, more…” We shouldn’t be on a constant mission to increase the numbers; more readers, more likes, more shares. But instead, we should be searching for “an engaged reader” – someone who gets us, is interested in what we have to say, and wants to come back time and again. I went to a second talk by Marte Marie Forsberg on creativity and inspiration. She told us that in her house when she was growing up there was a craft room, referred to by the family as The Blue Room, that was filled with everything you could need to be creative in any imaginable discipline. Every Monday evening, parents and children sat down together for a few hours of making. I was practically texting my husband to demand an extension to our house asap, so we can do the same. As well as the talks, I met lots of really lovely bloggers, some of whom I felt I already knew well having read their blog for ages, some of whom were new discoveries. But, I’m restricting myself to telling you about just one awesome person I met: Sarah from A Life Less Physical. I got chatting to Sarah at the very start of the day and she was witty, dry and refreshingly honest. After having a good read of her blog this morning, I can say she writes in the same way. Do check it out. And the best thing of all: every single person I spoke to seemed genuine and interested. And not a single one told me they needed to end a gossipy conversation in order to go and network with someone more important. Ah, I think everyone was a bit shy. It’s a very weird thing meeting people from the computer in real life! There’s a huge range of potential embarrassments: do they know my blog? Do I know their blog? Did they write that post I am thinking about or was it someone else and should I mention it or not?! etc etc etc. haha, I cannot believe that guy actually said that. That is kind of funny, in a cringe-inducing way. I am honestly still so overwhelmed by everything, and because I have a tendence towards navel-gazing too (blog and otherwise) I cannot shake the feeling that I should have done a better job at connecting with other attendees. But I did really enjoy myself, and like you, I found incredible inspiration in all these creatives sharing their craft and their struggles with us! Grace’s talk was fantastic, I found it very encouraging! I wish I had it to watch over and over every time I feel discouraged and not good enough. Good for you! I am so happy that you went . Seems so wonderful and weird to go just to find out to be yourself, engage with people who like the same stuff as you, and stay true to you. Right? But it is necessary. That and a craft room. It was SO nice to connect with lots of bloggers and creative types in such a friendly way. I have been to events where there was no mingling at all, everyone just chatting to people they already knew and looked at you weirdly if you tried to talk to them. The friendly atmosphere at Blogtacular = very refreshing! PS sorry if this posted more than once, I was having problems logging in to comment.